Home » Baroque costumes. 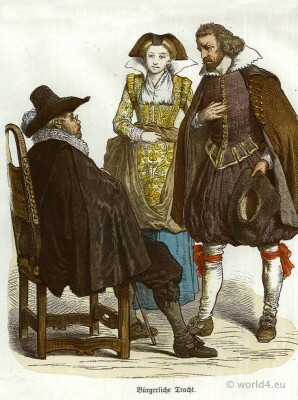 Germany 16th century fashion. The clothing of the men is influenced by the dominant Spanish fashion. The dress of the woman has Italian, to French influence. Evidence of the soft folds of the skirt as well as their colors. The waist is set low. The richly embroidered, stiff Bodice is covered with sleeves and high collar. The hair is combed upward. The sleeves are narrow, with ruffles at the end and end up on the shoulder with an ornament in the form of a spherical padding. The cone-shaped skirt is floor length and is open from the hip or gathered up so that the starched linen petticoat coming to light, forerunner of crinolines skeleton. 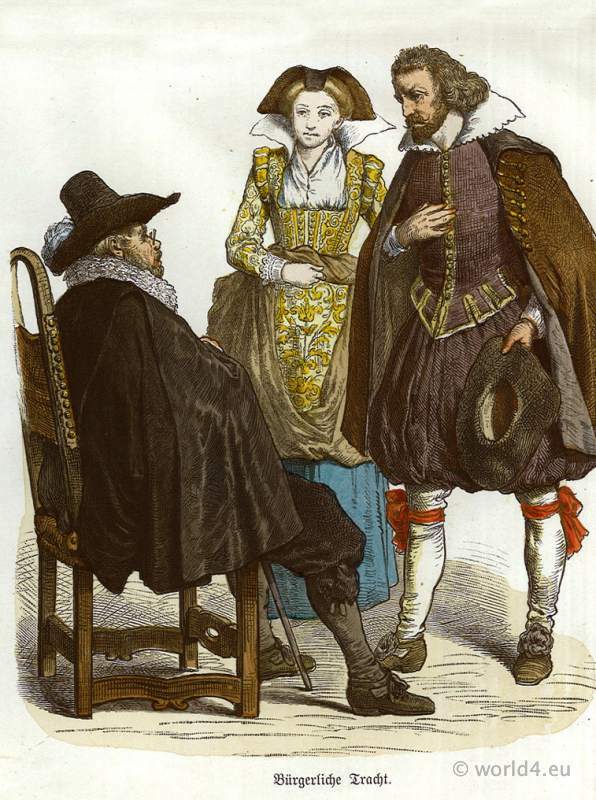 The man sitting on the left wears a large, decorated with Spanish lace ruff, stuffed trousers, the Spanish cap is made from exquisite fabric. As a sign of higher status a stick. On his head is a spring-adorned Barett stiff. The jacket is made from exquisite fabric. As a sign of his class as a patrician, he has a walking stick in his hand and a valuable ostrich feather adorned Barett. Louis XI fashion era. French Ancien Régime. Renaissance, Baroque fashion history, Tudor fashion era.